Bruce Field. All photos by Philip Ruskin. How to make the chicest place in the world to shop even chicer? Add a fine men's suit and even finer French bonbons. PARIS — Food and wine may be one of the world’s most ubiquitous pairings, especially in France, but I’ve discovered another ideal Parisian duo: food and fashion. The charming and chic Saint-Germain-des-Prés neighborhood has some of the city’s best cafes, restaurants, and boutiques, including men’s shops where I’ve consistently found great quality, choice, and value — savings that I’m only too happy to spend on nearby chocolates and patisseries as a reward for, well, for anything and everything. 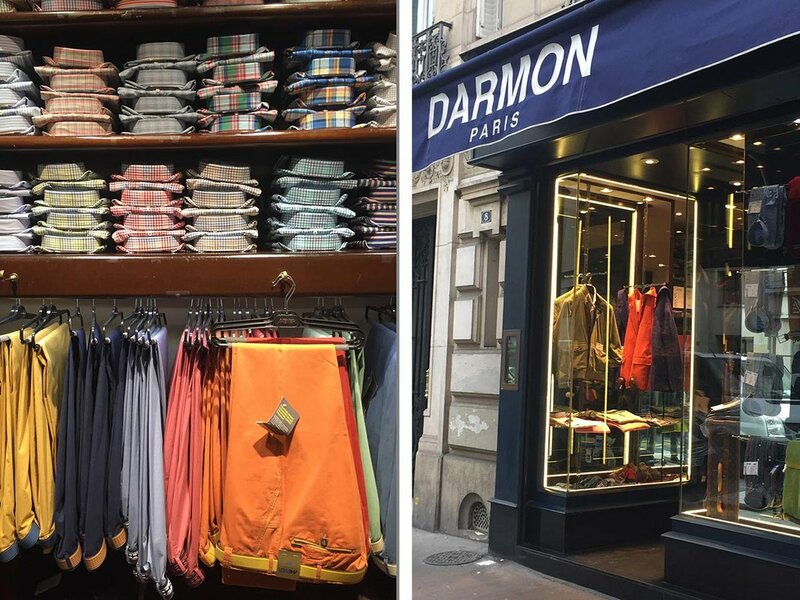 If an afternoon of cocoa and clothes are on your Paris agenda, take the metro to the St. Germain-des-Pres or Odeon stops in the 6th arrondissement and hit this baker’s dozen for suits and sweets. 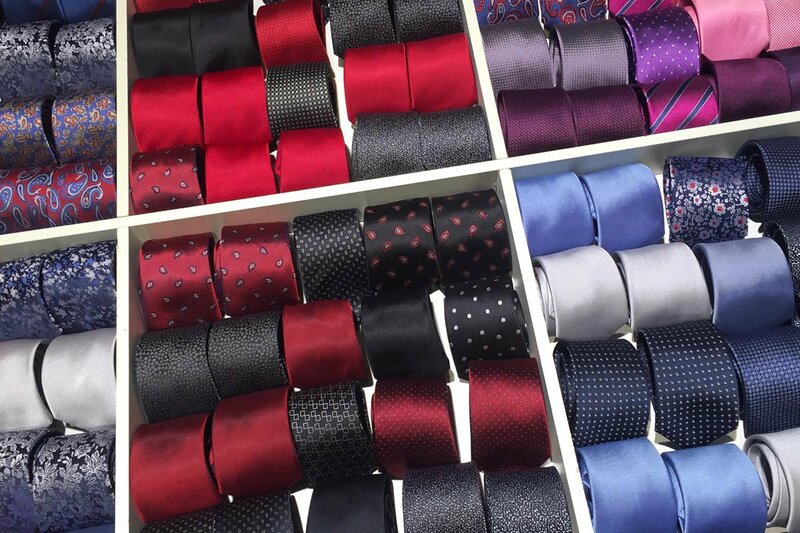 Silk ties at Bruce Field. 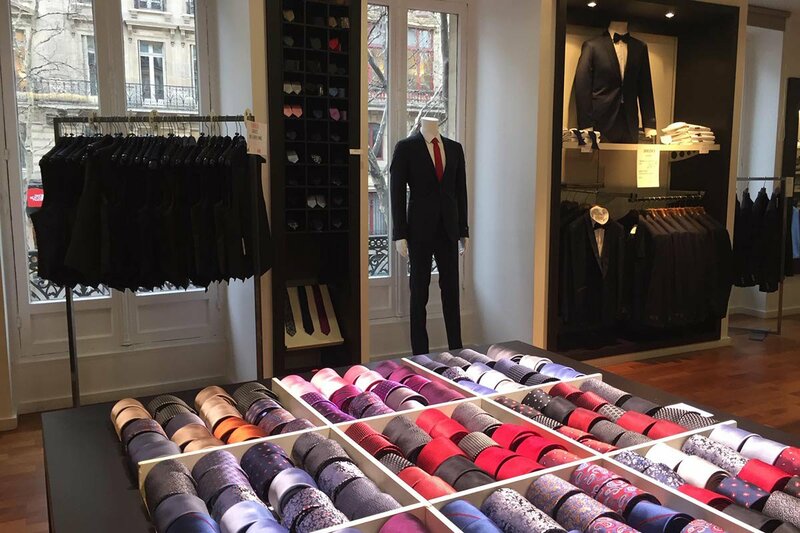 If there had been a French Brooks brother, his shop might have looked like this: an impressive selection of cashmere sweaters, polo and dress shirts, jeans, and casual and dress pants. Style tip: The merino and wool flannel trousers drape perfectly and come in slate and charcoal grey. Matching jackets are sold separately if you’re looking for a suit. A cozy boutique with a more limited range of selections, which makes it easier to choose from their terrific assortment of colorful khakis, unstructured jackets, jeans, and button-down shirts. This is a great place to see which colors are in style at a glance. Style tip: Don’t leave without one of their ultra-soft, button-down collar denim shirts. It won’t win any awards for interior design, but, for classically cut, high-quality men’s jackets at a great price, this shop gets my vote. Style tip: I scored a remarkably versatile, durable, and well-cut dark green herringbone merino wool blazer. Un Dimanche à Paris and Cours du Commerce Saint-André. Cours du Commerce, an 18th-century cobblestone alley lined with boutiques and cafes, feeds into Boulevard St. Germain. Nestled in this cozy shopping corner is Un Dimanche a Paris, a chocolate shop, patisserie, and a restaurant. Gallery-style lighting draws attention to shelves filled with artfully displayed chocolate bars in an array of cocoa percentages and countries of origin. 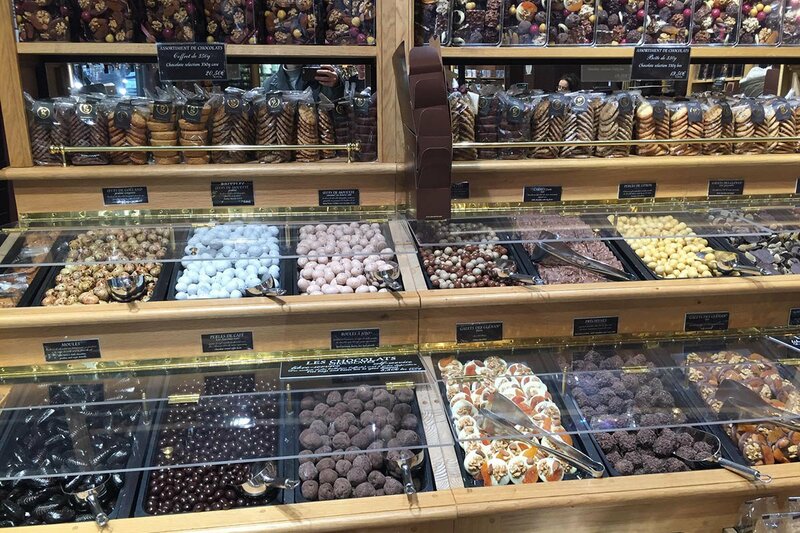 A wide assortment of bonbons are arranged in perfect symmetry at an island counter — a display worthy of a fine jewelry shop. An adjacent chocolate bar serves rich creamy hot cocoa. Mountains of macarons in the pastry vitrine announce the transition from chocolate shop to patisserie. Sweet treat: Don’t leave without a box of chocolate-covered almonds (another world-class pairing to rival food and wine). Ranked a Meilleur Ouvrier de France (the best craftsman award that's “MOF” in French parlance and is basically a knighthood for chefs), Patrick Roger refers to himself as a sculptor who brings chocolate to life. Oversized chocolate sculptures are displayed in each of Roger’s ultra-minimalist and sparsely lit boutiques, and the wow factor and artistry are as impressive as his confections. Boxes include chocolate-covered almonds, orangettes (peel zest), ginger, ganache, pâte de fruits, and classic pure butter truffles. Sweet treat: Chocolate bars come in sleek black tins that are ideal for traveling, gifting, or carrying in your bag to enjoy as needed, a.k.a. at all hours in Paris. Larnicol is another Meilleur Ouvrier de France. Where Patrick Roger’s food art is austere and Instagrammable, Larnicol inspires your inner child with bountiful bins everywhere. This is more like the good old-fashioned sweet shop where you fill your bag of candy by weight. It’s fun to see grown-ups giddy with glee — an especially rare sight in a city filled with reserved Parisians. Sweet treat: The signature bonbon here is the Kouignette, a take on the Kouign-amann Breton cake. The buttery puff pastry cookies come in eighteen varieties. This one is not in the 6th, but, since you’ll be exploring Paris anyway, it’s worth the ride to the 20th arrondissement to shop this gem of a confiserie, chocolaterie, and wine shop, especially if you fancy yourself a true enthusiast. In his former life, curator and owner Franck Rivero was a bass player in a band. Today, he's a guitar-playing oenophile and chocolate connoisseur. Sweet treat: Rivero stocks sweets made by master chocolatier Stephane Bonnat, whose bar chocolate is among of the finest in the world. This is one of the few places you can find his pure butter chocolate truffles outside Bonnat’s own shop in Voiron, France, and also his Cuban Bean bar, which is not available anywhere in the United States. 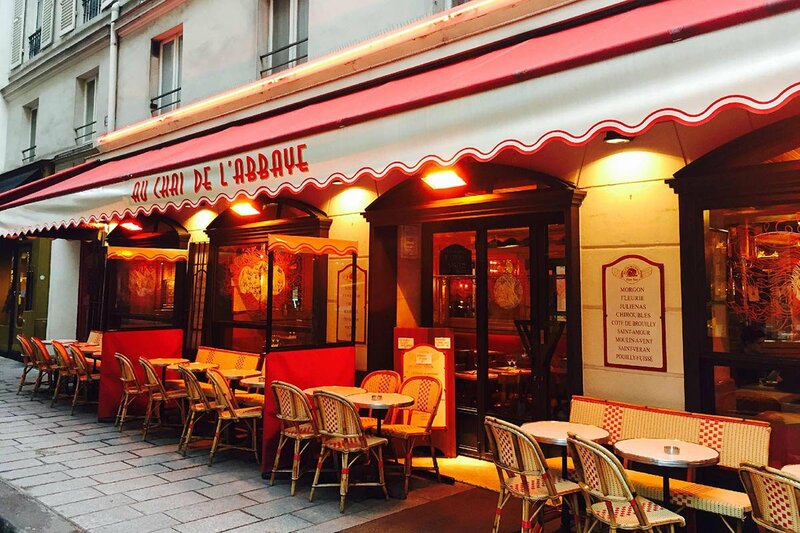 A comfy little café with a cheery feel and classic fixtures that serves remarkably good country cuisine. 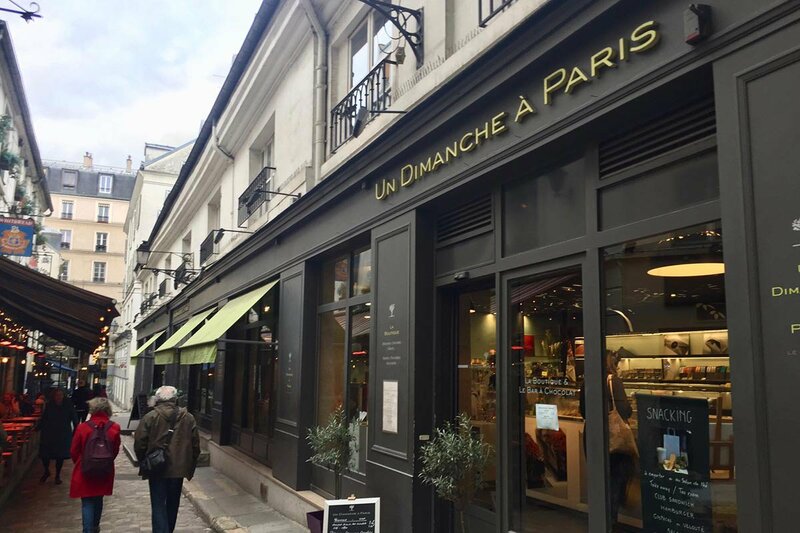 I like to come here after a spree to take stock of my finds, have a satisfying lunch, and people watch on bustling rue Buci, right off St. Germain. Chou farci d'Auvergne, a tasty stuffed cabbage, pairs perfectly with a glass of the house white. Plus the baguette is from the world-famous Poilâne bakery nearby. Exchanges and refunds are not customary in France, so make sure you’re pleased with your purchase. If you try on a lot of clothes and leave empty-handed, you may find yourself on the receiving end of unkind looks and grumbling asides. If you’re looking to save time when shopping, check out the clothing and confectionary offerings beforehand on the company websites. Less Than 24 Hours in Paris? No Problem. Philip Ruskin is a New York based marketing communications consultant, NYU Adjunct (and drummer). You can follow him on Instagram and Twitter. He travels for the pleasure of discovering inspiring people, places, ideas, and tastes.